Education in Dubai covers many levels from primary, secondary to collegiate schools, and there are several of ethnics and linguistic groups. 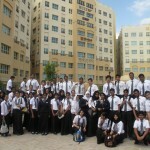 You can also find international schools in Dubai. There are many public as well as private schools in Dubai, the public school is Arabic and the secondary language is English, while private schools are in English. There are also schools for girls only and there are catholic schools as well as Christian schools. One the great things about the education and schooling in Dubai is that you have the opportunity or your child have the opportunity to meet students from variety of countries and cultures and can form a valuable friendship with them, and your child can gain much greater global awareness compared to reading social or history books in your won country. If you have toddlers, you also find lots of nursery in Dubai, or daycare center with reliable care givers which has a professional background of education and care giver background. You can rely on day cares in Dubai for your child’s safety and you can also find an international day care where the primary language is English. •	Bright Morning Nursery – beautiful premises with large back yard and swimming pool a first class nursery, a high level service from day care to crèche and through the pr- school stage. •	British Orchad Nursery – this nursery follow the British nursery curriculum with structure and progression. British Orchad Nursery Opens from 7 am to 5 pm. •	Dubai Carmel School – this school is integrated and accredited by University of Cambridge through British Council and teaches children from Kindergarten to primary 0-level. •	Dubai British School – This school offers Curriculum for England from 3 years old to 18 years of age, only international qualified teachers teach at Dubai British School. •	Dubai International Academy – provides high quality and challenging education that creates an enduring passion for education and empower each students to make a positive contribution to local and global communities. •	Al Diyafah high School – Al Diyafah high School started as Kindergarten 25 years ago, today it consist of Kindergarten, primary and secondary school and also offers school transports for its students. •	Al Kaleej National School – This school follows the U.S Curriculum, also offers kindergarten and primary as well as secondary school. •	American School Of Dubai – Located in Jumeirah, and follows accredited US Curriculum, and this school offers travel opportunities for their students for athletic, academic and social purposes. •	American University in Dubai – one of the first universities in Dubai, AUD has American programs and teachers, there are also undergraduate programs in AUD.